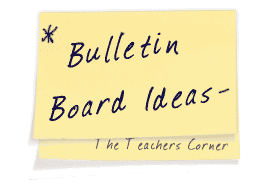 Our Writing Bulletin Board Ideas page will provide you with great resources for a number of writing related topics. Our bulletin boards will help you integrate various activities into your daily curriculum. Ideas within the writing bulletin board pages include resources for the following: editing, displaying student work, steps of the writing process, and writing techniques. This is a great idea that can work for any poem. It is an activity that you can incorporate into your classroom on a regular basis. Use various seasons and/or holidays to inspire your choice of poetry. Once you have selected the poem you want to use, you will read it out loud to your students several times. While you are reading it out loud, students will use a plain, white piece of paper to draw what they are visualizing. You can provide your students with a variety of art supplies to color their work. Finally, use a large piece of chart paper to write out the poem of your choice. 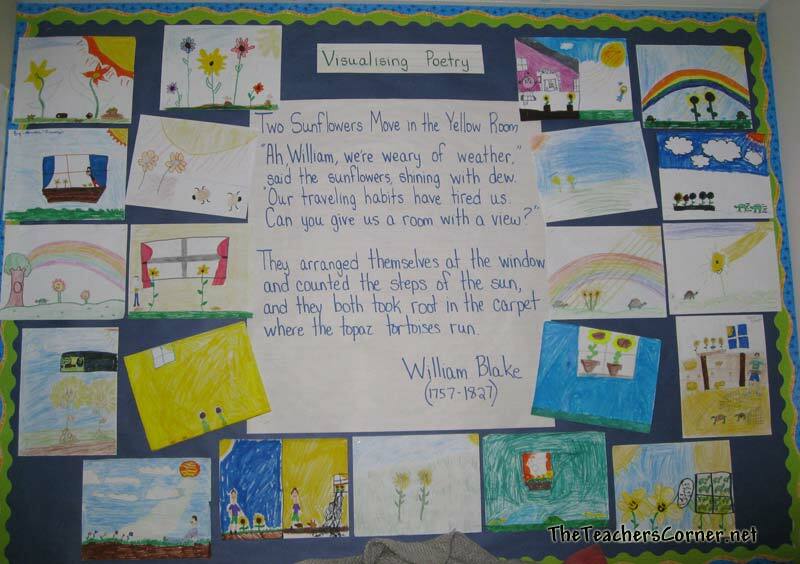 Post the poem and students’ work. 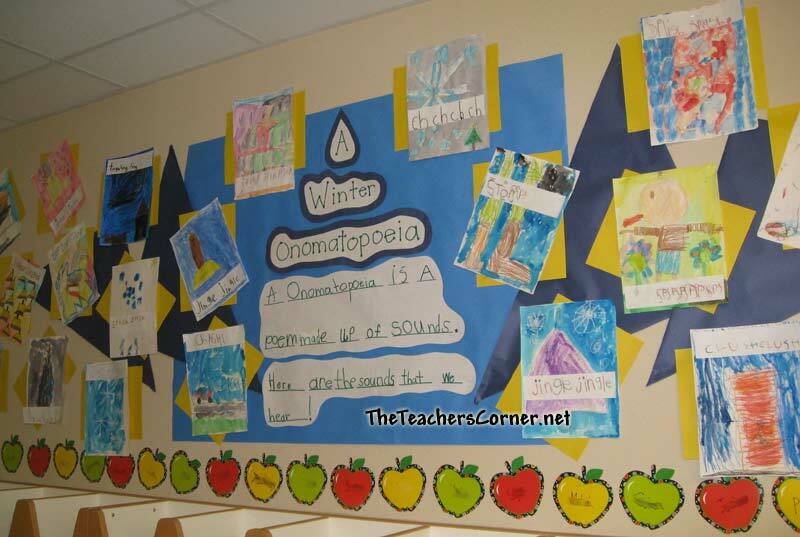 The photo shows a “Winter Onomatopoeia”, but this is a great activity for any season. As an interactive writing activity, students completed the definition of an onomatopoeia. They then wrote the sounds of winter on small strips of paper. Finally, the students used water colors to create their art work. Read a variety of books that will help students learn more about the season you are focusing on. Once you have displayed the work and are ready to take it down, collect all of the work into a book that can be bound and placed in your classroom for students to enjoy, even after the season is over. I wrote each child's name on a pencil-shaped pad (Carson Dellosa type), then mounted the pencils about 8 inches apart on a bulletin board. Below each pencil, I hang the child's latest writing -- a published story or anything else we're working on. I made a banner that I posted above the bulletin board that says "Published Authors." I add seasonal touches, like fall leaves, snowflakes, raindrops -- throughout the year. Then I only change the child's work, not the whole board. I always have their work displayed, and I can tell at a glance whose work is missing! I have made one of my bulletin boards into a Writing process board. 1. Put up any color paper and border you'd like. 2. Cut string the same size as the width of your board. 3. Staple the string so you have divided your board into 4 sections. 4. Label them brainstorming, rough draft, editing, and publishing. 5. Have the students decorate a 3X5 index card and use a pushpin to fasten to the board. As the students move through the writing process, they can move their card. Not only do you know who is on track, but it also helps you to know how to conference with. Please use the email link at the top of the page to send us your writing bulletin board ideas!